Unsightly phone cords be gone! Books on the nightstand are no longer just for late-night reading; now your phone has a nifty new home while it recharges, thanks to a clever DIY-er. This week we're giving ourselves a bit of a break after a hectic and awesome finish to 2011. We've dug out some oldies but goodies from the Curbly archives that you may have missed. Today; check out this fun upcycling idea: making a purse from a secondhand book! Click here to read the original blog post! And make sure to check back tomorrow for another blast from the past. This holiday season, Curbly asked our friends, peers, and favorite design bloggers to stop by, have some hot cocoa, and tell us what gifts they'd like to receive this year. Today, we're excited to welcome Cambria Bold, the managing editor of our favorite green and sustainable design blog, Apartment Therapy's Re-Nest. As they say, coziness is next to godliness. (Wait? Is that not what they say?) This time of year I like nothing better than a stout evergreen tree (complete with kitschy ornaments and twinkle lights), something toasty sweet baking in the oven, Sufjan Stevens' Christmas album, and a free Saturday to enjoy it all with my husband. Imagine this: On the eve of your 29th birthday you lose your job. What do you do? Well, if you're Molly Bakes you stay up until one in the morning baking and frosting 30 cupcakes for your friends. That evening proved pivotal for Molly, as it was the beginning of a love affair for baking and a new career. In my family Halloween is our favorite holiday. Some years we go more all out, others we keep it more low-key and elegant. And we generally keep the outside of the house pretty tame until the day of trick or treating, when cobwebs and luminaries and spooky music make their appearance. But there's just something about these spooky silhouettes that make me think this year's going to be a little bit different. This is my pathetic bookshelf. Yes, I still have college my textbooks. I wish I could say my bookshelves were full of classic novels and first editions, but the best I can do is a 3rd Edition of Hypnobirthing and an entire row of fantasy books. If that doesn't hurt my literary morale enough, the shelves are unorganized to boot. What I need are some attractive bookends to make my book collection look a little more impressive and easy on the eyes. There are a few things that simply seem to belong on a bedside table: a lamp, alarm clock, perhaps a pair of glasses, and a few magazines or books. Then, once you add a few personal items (mine usually include a crossword puzzle or two and a glass of water), and there's not a lot of extra space for any accessories or "decor" items. So, I wanted to make something to add a little bit of fun and style, but that doesn't take up too much prime nightstand real estate or interfere with the other items. DIY "Colour-In" Dress is the Coloring Book You Can Wear. All you gotta do in stay in the lines. There's something about Halloween that brings out the best creativity in each of us. Perhaps its the ability to hide behind a facade that allows one to take a risk to step out and be their most amazing... or perhaps it's just all the sugar. 8 Ways to Customize Your Billy Bookcase. Ikea News: The Billy Bookcase Book. The Billy Case System, the world's most sold bookshelves [I got four, how many do you?] is turning thirty this year. To celebrate? Ikea is releasing a book to celebrate its release: "Billy, 30 Jahre Jung." The bookmarks above were expertly printed and photographed by one of my favorite blogger, Jessica Jones of How About Orange, who featured these bookmarks here. How to turn playing cards into books. Turn a book into a picture/card holder. Take one old hardcover book. Fold the pages in half. Tuck in pictures, post cards, etcetera. To see another not quite as charming example of a folded paper card holder, go here. From Sweet Paul. Photo by Ellen Silverman. How To: Make a Book Rack from a Wire Hanger. 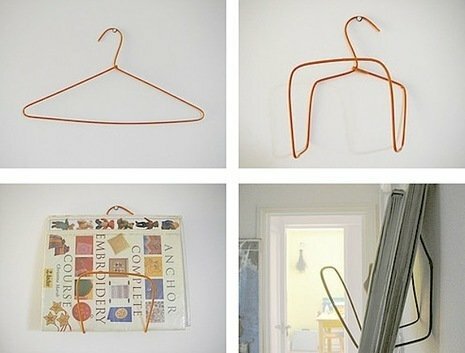 Here's a clever and useful way to reuse those ineffective wire hangers that come from the dry cleaners: a repositionable book or magazine rack. Don't be alarmed, the instructions are in Portuguese, but the photos make the process clear. Or, if you speak Portuguese, don't be alarmed, because you can read the instructions.